In our body, the Blood and Immune System Cells are the erythrocyte or a leukocyte cells found in the body fluids circulating throughout the cardiovascular system. In our body's blood, the Blood Cells (Blood Corpuscles) are the cells contained in blood either as an erythrocyte or a leukocyte found in the body fluid circulating throughout the cardiovascular system. Seven types of blood cells and cell fragments. In our body's vascular system, aka the Blood System, contains about 5 liters of blood, accounting for about 7% of our body weight. Blood is the bodily fluid that delivers substances to our body's cells and transports waste products away from those same cells. 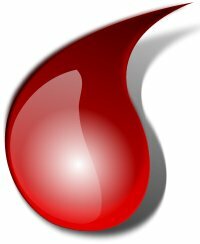 Blood is composed of blood cells suspended in a liquid called blood plasma. The blood cells present in blood are mainly red blood cells (erythrocytes), which comprises about 45% of the bloods volume. Red blood cells contain hemoglobin, an iron-containing protein, which facilitates transportation of oxygen by reversibly binding to this respiratory gas and greatly increasing its solubility in blood. In our body's vascular system, the blood cells present in Blood contain White Blood Cells (including leukocytes and platelets), which comprises about 1% of the bloods volume. In our body's blood, Blood Plasma (Plasma), the intravascular fluid part of extracellular fluids (ECF), is a straw-colored liquid component of blood, in which the blood cells in whole blood are normally suspended. In our body's blood, Blood Plasma is mostly water (93% by volume) and contains Dissolved Proteins, Clotting Factors, Glucose, Mineral Ions, Hormones and Carbon Dioxide. In our body's blood, Blood Plasma (Plasma), which comprises 55% of blood fluid, is about 90% water by volume, and contains dissolved proteins, glucose, mineral ions, hormones, carbon dioxide, platelets and the blood cells. In our body's blood, Blood Plasma is the main medium for excretory waste transportation. In our body, Carbon dioxide (CO2) is mostly transported extracellularly dissolved in plasma as bicarbonate ion. In our body's blood, Blood Platelets (Thrombocytes) are small irregularly-disk-shaped non-nucleated (anuclear) blood cells, 2-3 um in diameter, formed in the bone marrow via thrombopoiesis, from the fragmentation of precursor megakaryocytes representing the final stage of megakaryocyte development, mainly involved in the blood coagulation process with an average lifespan between 8 and 12 days. In our body, the fundamental role of Blood Platelets (Thrombocytes) is in hemostasis and a source of growth factors. These platelets circulate in our blood and are involved in hemostasis, leading to the formation of blood clots when blood vessels are injured. In our body, Blood Platelets (Thrombocytes) release a multitude of growth factors including platelet-derived growth factor (PDGF), a potent chemotactic agent, and TGF beta, which stimulates the deposition of extracellular matrix. Both of these growth factors have been shown to play a significant role in the repair and regeneration of connective tissues. Other healing-associated growth factors produced by platelets include basic fibroblast growth factor, insulin-like growth factor 1, platelet-derived epidermal growth factor, and vascular endothelial growth factor. In or from our body, Serum (Blood Serum) is the clear portion blood plasma without fibrinogen or the other clotting factors (i.e., whole blood minus both the cells and the clotting factors). In or from our body, Serum (Blood Serum) is the liquid part of the blood remaining after clotting, and is therefore lacking in clotting factors and distinct from blood plasma. In our body's vascular system, the blood, blood cells mainly present are Red Blood Cells (erythrocytes), aka RBCs, which comprises about 45% of the bloods volume. RBC contain Hemoglobin (Hb or Hgb), an iron-containing protein, which facilitates transportation of oxygen by reversibly binding to this respiratory gas and greatly increasing its solubility in blood. In our body's vascular system, RBC is the principal means of delivering oxygen (O2) to the body tissues via the blood flow through the circulatory system. RBC's take up oxygen in the lungs and release it's stored oxygen, while squeezing through the body's capillaries. In our body's vascular system, Red Blood Cells (Erythrocytes, RBCs) are the most common type of blood cell in the our body. RBCs as mature erythroid cells, are biconcave-shaped cells have the tall task of carrying oxygen to our entire body; in women there are about 4 to 5 million RBCs per microliter (cubic millimeter) of blood and about 5 to 6 million in men. People who live at higher altitudes have even more erythrocytes (RBCs) because of the air we breathe has lower oxygen levels at higher elevations. Hemocyte is a non-human blood or formed element found especially in certain invertebrates.